Jing is a mental phase where the mind quiets down and ignores the mental chatter that we are normally bombarded with. Jing means to be focused and aware of your self and your surroundings. It has been said that Sun Lu-Tang, creator of Sun style tai chi, claimed that the highest level of tai chi is when it merges with the Dao and one is in harmony with nature. 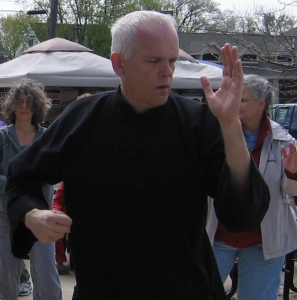 Tai chi practice can develop your ability to move from your learning mind to your performance mind. Learning mind (conscious mind) – The learning mind is engaged when learning the form. We practice each part and put them together into the form, linking each part together. We then begin integrating the essential principles into the whole. Performance mind (subconscious mind) – With practice, the form becomes second nature. The learning mind begins to give way to the performance mind. As the performance mind takes over, the mind begins to lead the body and mental quietness develops. It can take time to develop a quiet mind. It improves with practice. With each successive practice, it takes less time to return to a quiet mind. Gradually, you will be able to move to a higher level with better focus. Mental quietness calms the monkey mind that bombards us with random, jumpy thoughts. It helps us cope with stress and crisis. Maintain an upright posture. Concentrate on your dan tien. When you exhale, gently contract the muscles in the lower abdomen and pelvis while keeping the muscles still above your belly button. Imagine that you are bringing your pelvic floor just a little closer to your belly button. When you inhale, allow the muscles to relax while maintaining a little bit of the muscle contraction. Slow movements help you breathe deeply and help to sink the qi to the dan tien. Jing works to promote calmness and serenity. When you use your mind actively to focus on and enhance your body movements, you build a strong mind/body connection. Your energy follows your intention. In addition, jing activates our parasympathetic nervous system. This calms our body and reverses the effect of stress. People often find that jing improves their ability to handle stress. This is Meditation in Motion where you can find harmony with nature. This entry was posted in Meditation in Motion and tagged quietness, serenity, tai chi. Bookmark the permalink.